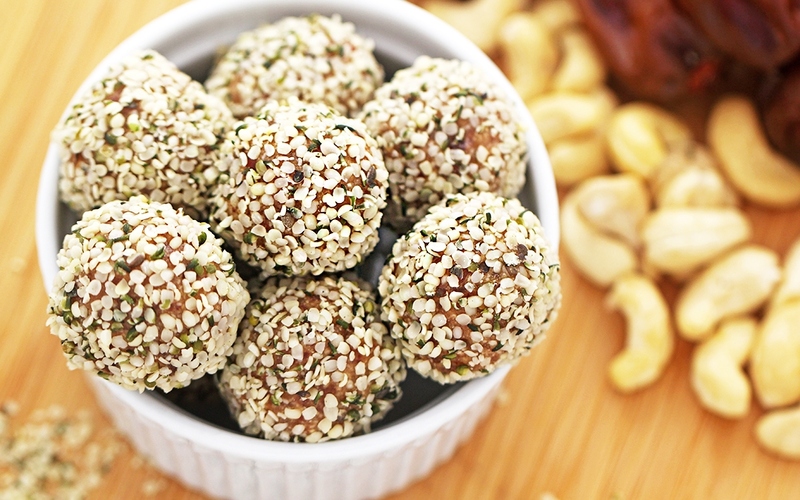 These Hemp-Seed Energy Balls are a convenient and delicious snack that is perfect for warding off afternoon hunger pangs or for giving you an energy boost just before a workout. Plus, they’re easy to make and only require three ingredients! Dates are a wonderful source of natural sweetness and hold these energy balls together, while cashews add some protein and healthy fats. However, what really makes these special is the hemp seed, which is an exceptionally rich source of omega-3 essential fatty acids and a plant-based complete protein. These energy balls will last up to a week in the fridge or you can always freeze them to enjoy later! 1. Add dates and cashews to a food processor. Process until ingredients are well incorporated and smooth. 2. Add the hemp seeds to a medium bowl. 3. Use a tablespoon to portion the date and cashew mixture. Roll with your hands into one-inch balls and then roll each ball in the hemp seeds to coat. 4. Enjoy immediately or store in a sealed container in the refrigerator in a single layer.